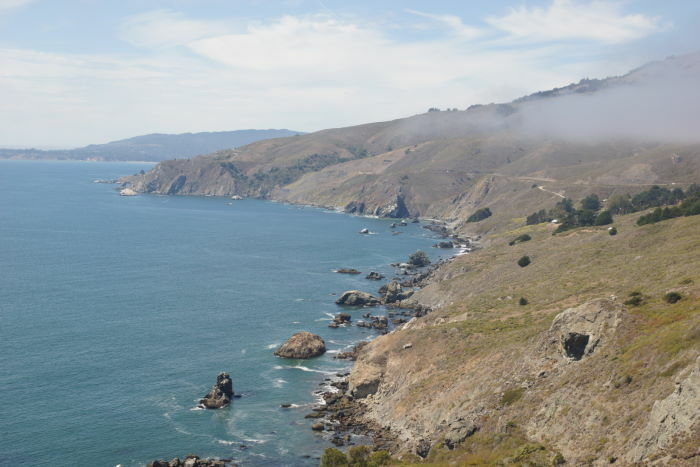 You might be shocked to see how quickly the California coast goes from densely populated and developed in San Francisco, to rugged wilderness in Marin County. All you have to do is cross the Golden Gate Bridge, then set out on an adventurous journey on California Highway 1. 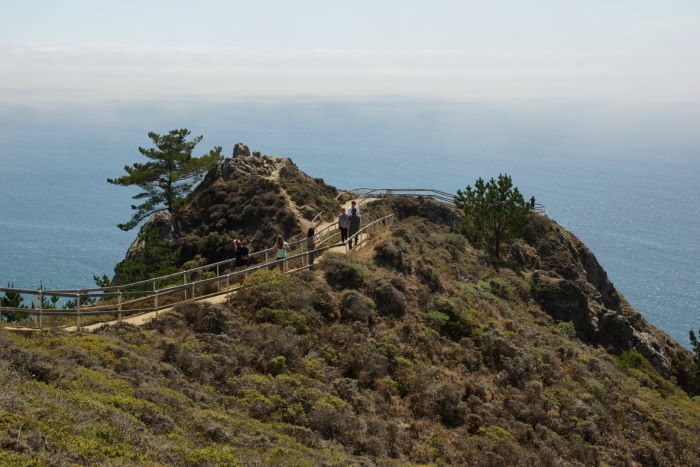 Once you’ve crossed the Marin Headlands and arrive back at the coast, your first good viewpoint will be at Muir Beach Overlook. California 1, the Shoreline Highway, splits from US 101 at exit 445b. 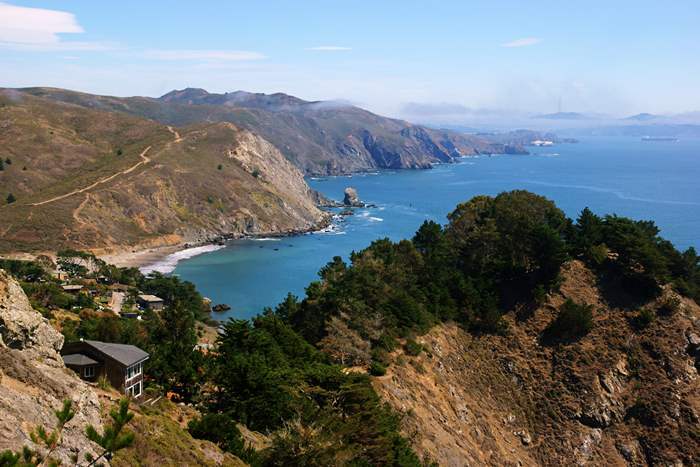 Follow Highway 1 for about 7 miles, until you reach the coast, and watch for a left-turn onto a road that leads to Muir Beach Overlook. I had a very long drive ahead of me. I was planning to go all the way from San Francisco to Fort Bragg, California, on Highway 1 the entire way. That’s a long drive on the preferred route (US 101 and California 20), but when you take the narrow, curvy Shoreline Highway, it’s a much slower experience. And even though I had just left San Francisco a short while ago, I was already ready for a break from the car, to see some scenery. So, I decided to make a quick stop at Muir Beach Overlook. … but the highlight of this stop is a short trail that takes you out to the end of a bluff. Along that trail, you get the very best view. You might want to click on that photo and expand it, so you can see everything. If you look closely, you can see the mouth of San Francisco Bay, as well as Sutro Tower – the somewhat hideous broadcast tower that rises from Mount Sutro in the middle of the city. 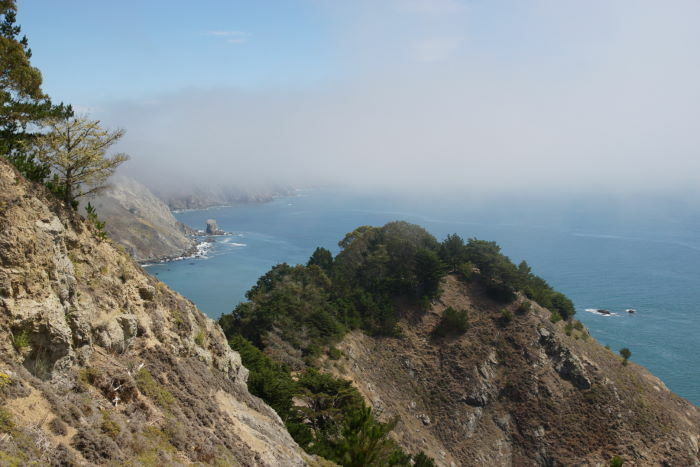 If you look to the middle-left of the photo above, you can also catch a glimpse of Muir Beach. There’s another parking area that allows access to this beach, about a mile south on Highway 1. Both areas are managed by the National Park Service, as part of the Golden Gate National Recreation Area. … and within five minutes of my arrival, I couldn’t see San Francisco anymore. But, that’s how it goes in San Francisco. 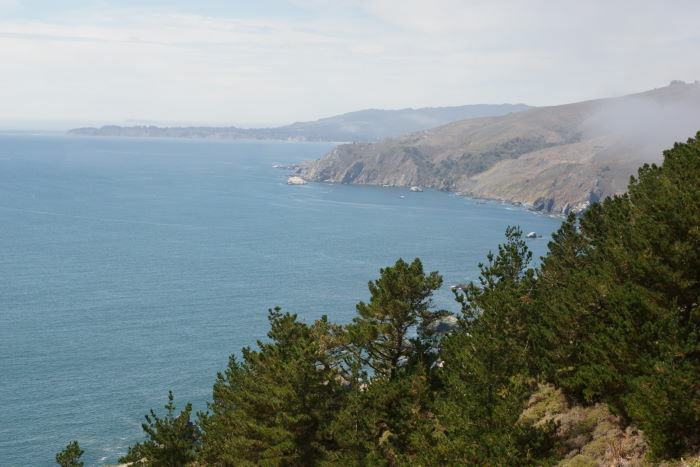 Muir Beach Overlook is worth a quick stop, while exploring the Marin Headlands, or on your way up the Shoreline Highway. Depending on the weather, you might need to wait around a while for the view to clear.